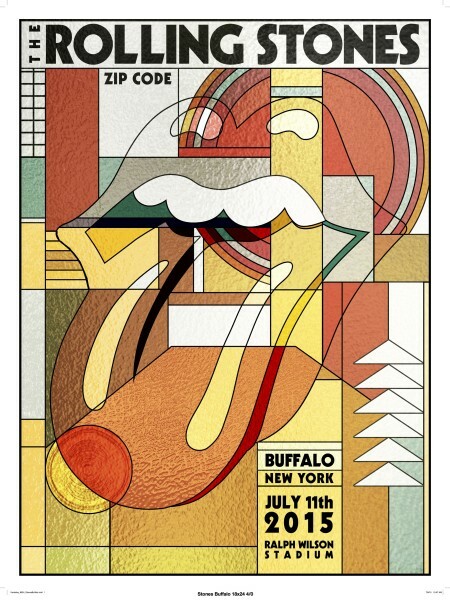 This thread is for live updates and comments regarding The Rolling Stones Buffalo NY USA 11-July-2015 show. Please tell us your pre- and post-show thoughts and comments here. Buffalo is on Eastern Standard Time in America. Add 6 hours for Central European time, add 5 hours for UK time and so on. It is a beautiful sunny hot July day in Buffalo. Welcome to The Rolling Stones and fans. Have a great day and evening. I have an extra $175 for tonight if anyone needs a ticket. Have a great show tonight everyone! Edited 1 time(s). Last edit at 2015-07-11 18:05 by with sssoul. 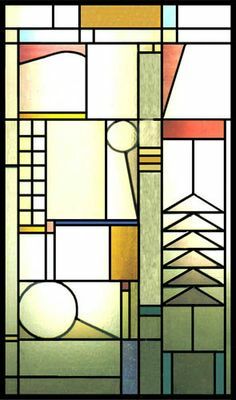 Frank Lloyd Wright inspired design for the poster. There are some houses in the areas he designed, (I don't know the details), and there is a famous office building downtown designed by his teacher Louis Sullivan, the great Chicago architect. Yes, thanks, that appears to be the inspiration behind the poster. In fact here is a picture of the actual pane which this poster heavily borrows from. So cool that you found this, Naturalust. Edited 1 time(s). Last edit at 2015-07-11 20:27 by open-g.
We ate breakfast at this bakery in Willamsviile Ny this morning and the waitress saw my tongue shirt and asked were we going to the concert tonight? After saying yes she said their bakery was contacted this week by the Stones manager to make them a cake based on the Let It Bleed album. I asked if I could I see it and of course volunteered to deliver it! Edited 1 time(s). Last edit at 2015-07-11 21:43 by roller99. Way cool! I wonder why they need it now, though! please contact CloudCat at svh @ indursky dotcom - thank you! Any word on sound check yet? Ticketmaster has put up a couple large blocks of tickets for $118 with taxes and fees that says obstructed view. They have been up for awhile in sections 114 and 131. I took a chance and bought two. Now that Cristiano posted a pic of the stage, they look like great seats with an unobstructed view. I hope. If you look at the pic on the right side of the stage, the long section that extends up into the red section is next to the so called obstructed section directly to the left of that going toward the stage. That is section 131 and next to that is the empty section not being used. Section 131 and 114 appear to have perfectly clear views. So I am off to the show! Then and now. 40 years ago! No disrespect to the City of Buffalo, but the possible last US show ever can't be in Buffalo. I'm supposed to be there, but earlier this week my wife was in the hospital so she finally knows the answer of what's more important, her or Mick. Perhaps the view will be like this? Debbie Tiger will, and maybe Selene Phoenix will periscope tonight. I hope you're wife is recovering nicely, JTHanis, and I think Mick will understand.